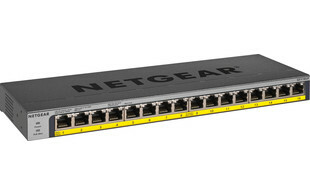 The Netgear ProSAFE GS116LP features Gigabit Ethernet ports to offer an unmanaged PoE/PoE+ switch. Ideal for SMB's, this switch offers an upgradeable PoE budget with interchangeable power supplies, enabling users to increase/decrease their PoE budget as required, effectively future-proofing small business networks and budgets. Each of the 16 Gigabit Ethernet ports support PoE/PoE+, making the GS116LP the ideal switch for deploying devices such as APs, IP cameras, VoIP phones, access control and IoT PoE-powered devices.